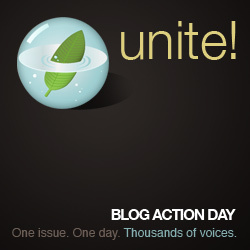 For Blog Action Day 2007, thousands of bloggers tried to raise other people's awareness about the Environment. Move to an environmentally-cleaner city than yours. Job search from there. Rearrange your work area for maximum natural light. Aood metric is whether you can see the recruiter's eyes on the other end of the phone line or not. If you need artificial light, only use fluorescent lighting, but not Off-White or WinterFresh White; try to find the ultra-rare Holy Grail White. You need a computer to read these tips, so get a refurbished machine before someone else throws it in a landfill. If you can't find one before this Blog Action Day thing is over, then at least buy an Energy Star-certified system. Make sure your job search computer is setup to waste as little electricity as possible. Not using it to job hunt will help tremendously. Also acceptable – not even turning it on. Have a current-sucking CRT monitor? Save electricity by searching the Internet with Blackle instead of Google. Have an LCD monitor? Search the Internet with Google instead of Blackle. Like night and day. Turn off your computer when not actively using it and/or when people are spamming you. Before is best. Go gadget green with rechargeable batteries in your wireless mouse, MP3 player or USB all-nighter coffeemug warmer without batteries. If you get thirsty while working, forget bottled water, drink tap water. If the tap water is brackish, don't. Avoid printing out CVs and cover letters unnecessarily. Try to anticipate in advance whether companies will need them or not. Better yet, decide instead for them and then go look someplace else where you're really needed and likely to be appreciated. Use recycled paper or ultra-expensive African non-tree paper. Or just stick with recycled paper. Recycle any rough copies or other document drafts that you no longer need. Bonus points if they contain your address or other identifying details. Mega bonus points for a credit card number or classified information that you put in the trash. Job hunt from home. If you have to go out, walk. If you don't want to sweat, use public transportation; take an electric bus or hybrid train. If you have to drive, get a hybrid car. If that's a challenge, carpool. Best of all- carpool in a hybrid. Wear a solar-powered jacket wherever you go, toting a solar-powered backpack containing a solar-powered flashlight. Look out for a solar-powered CV. Get a solar or wind-powered charger for your cellphone. Get used to walking with one arm held above your head. Before your next job interview, only shower with hot water from your solar-powered water heater (dud shemesh in Israel). If you don't have one, use your neighbor's shower. Reduce CO2 emissions by closing your mouth when walking to your next interview and from your next interview. How about your own environmental job search tips? This article is part of TheWritersManifestoBlog group writing project about tutorials. Subscribe to JobMob via RSS or email for more energy-saving job search pointers. What a hilarious entry to my group writing project. I’m sure you’ll get some votes for this, I love it! Don’t forget to check all the entries on my blog on the 20th too. My eyes are streaming with tears of laughter. Bravo, Jacob, well done! Jennifer: thanks, glad you enjoyed it. The article was fun to write. Monika: likewise. I’ll be watching on the 20th and I’ll repost the tutorial list soon thereafter here on JobMob. I find it way more useful than “fabulously funny”, but hey! Jen: absolutely, that’s what I was thinking. Just because we have environmental issues doesn’t mean that we need to be down in the dumps all the time. Xavier: interesting exposÃ© on Google on Google (pun intended, Blogger). Everyone can make a difference! If you are passionate about stopping global warming and the environment you should check out this website http://www.nvisionclf.com . Change to CFLs a great way for individual people to really make a difference! You should also check out this site http://www.youtube.com/user/helpourworld for more ideas on how to help our world!